Although many members of the British Royal family had visited Queensland since Queen Victoria reportedly decreed her own title to the name of the Colony in 1859, Queen Elizabeth II was the first reigning monarch to set foot in the State. Arriving in Sydney on 3 February 1954 she spent two months in Australia visiting every capital city, with the exception of Darwin, and many regional and rural centres. A significant proportion of the Australian population saw the Royal couple during the tour. 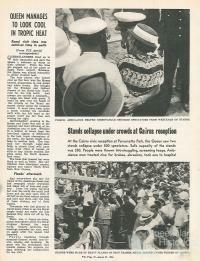 It was an extraordinarily popular event. The Queensland itinerary featured Brisbane 9-10 and 16-18 March, and the regional cities Bundaberg and Toowoomba 11 March, Townsville 12 March, Cairns 13 March, and Mackay and Rockhampton 15 March. 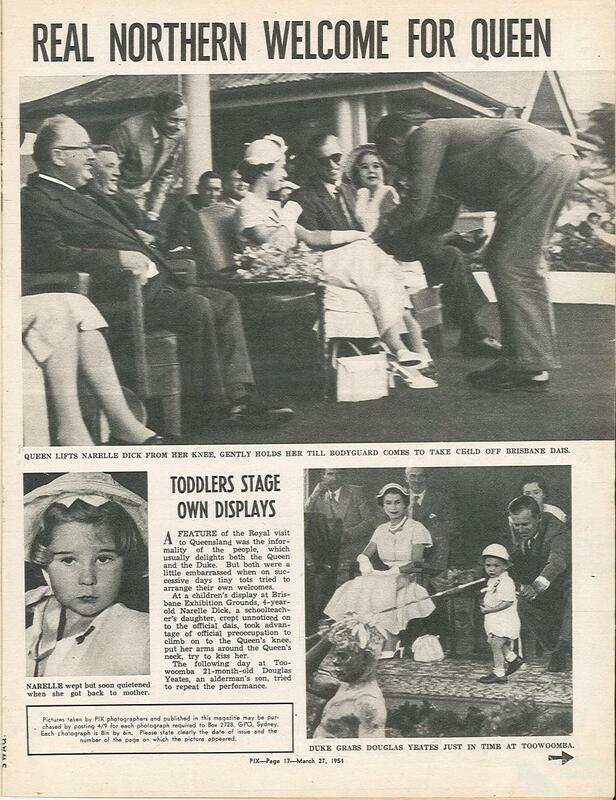 The Queen travelled 2600 km by plane, and the Townsville–Cairns–Mackay legs on the Royal yacht. 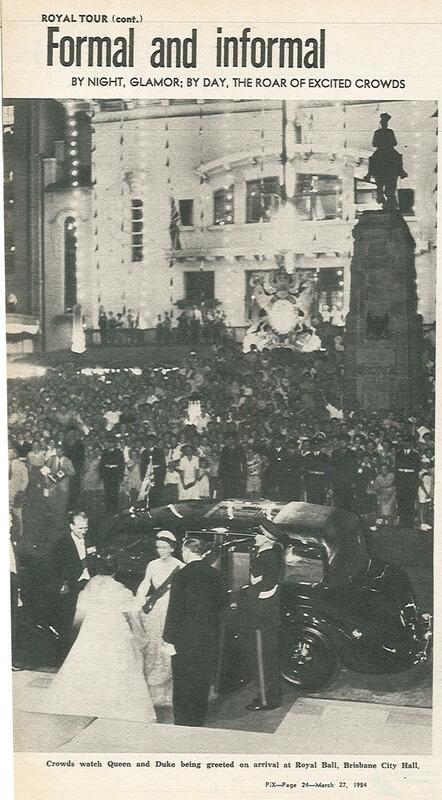 Despite the distance, the Queen’s trip never took her inland from the Queensland coast further than Toowoomba, but many Queenslanders travelled from the inland to see their Queen. 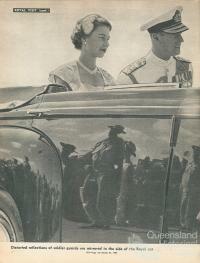 Despite the vast distance between the Monarch’s home and Australia, the Queen was a part of many people’s everyday life. 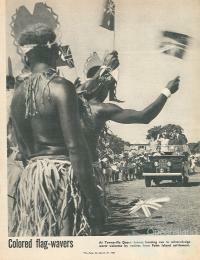 The visit to Australia was part of a six month round-the-world tour that had begun in 1953. The Australian leg began in New South Wales followed by Canberra, Tasmania, and Victoria. 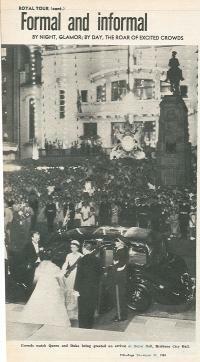 Queenslanders had to wait until 9 March for the Queen and Duke’s arrival in the State. Initial plans had included Queensland earlier in the Royal itinerary; however, this was met with opposition from many quarters. Queenslanders expressed fears that the heat and humidity in February might prove intolerable for the Queen and impact upon the outdoor activities proposed for the visit. After representations from the Premier, Vince Gair, the tour organisers agreed to alter the dates in the hope of more agreeable weather in March. 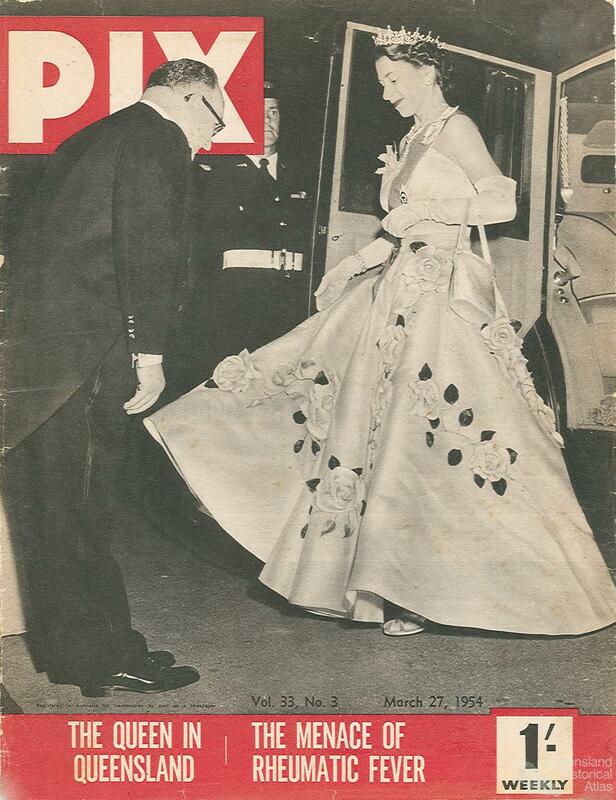 Although many were still concerned, the weather proved tolerable for all, including the Queen. 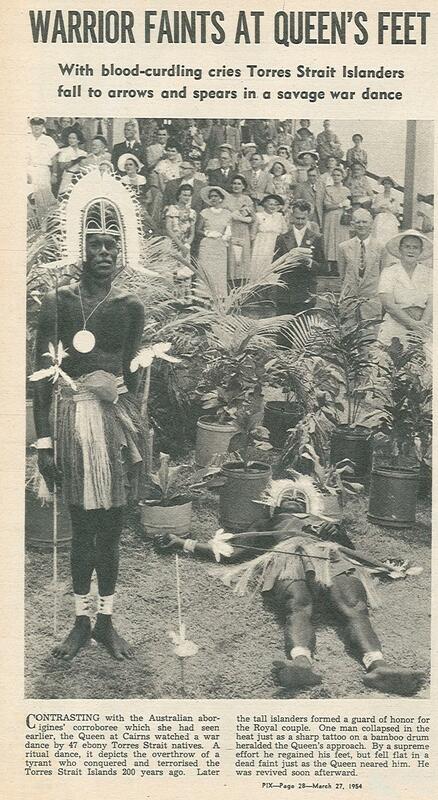 Thousands of Queenslanders greeted the Queen with great enthusiasm and informality. 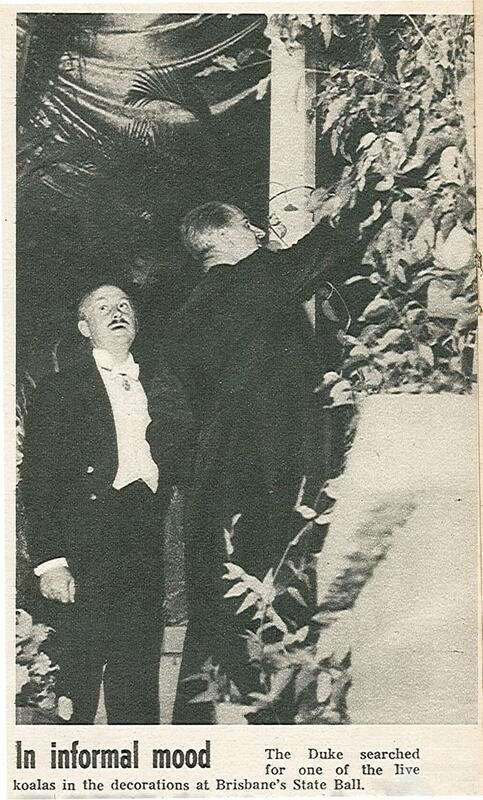 Through speeches and exhibitions Queensland was portrayed as rich in natural resources and agriculture with great potential for long-term prosperity. At a parliamentary luncheon held in Brisbane on 10 March the Premier talked of the major rural industries of Queensland including wool, sugar, beef and dairy, as well as the coalfields of Blair Athol and the Callide Valley. Although the Royal couple were in the State for only nine days they covered a significant distance and the areas they visited displayed the resources and achievements of that region. 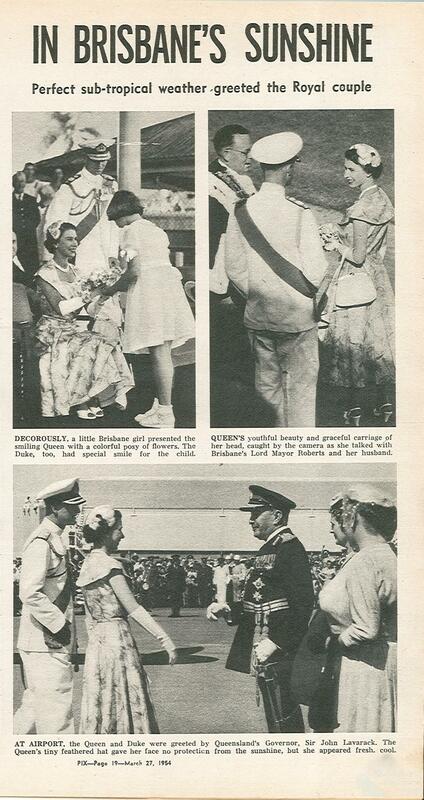 In Toowoomba, prized livestock of the district were paraded for the Royal couple at a reception at the Athletic Oval. At a Civic Ball held at the Brisbane City Hall on 10 March flora and fauna of Queensland was brought directly to the Royal pair where a representation of a rainforest, complete with flowers, foliage and waterfall was set up. The simulated gum tree provided a temporary home for nine koalas. 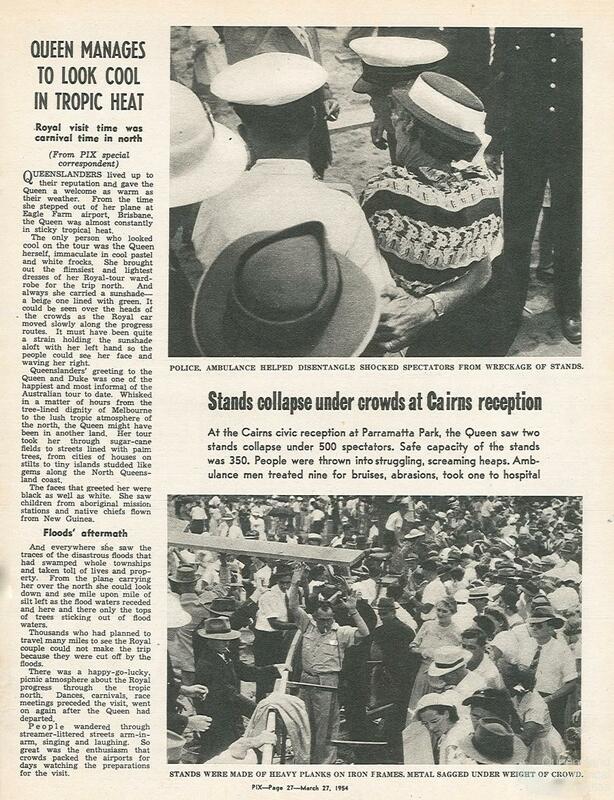 North Queensland was in flood in the lead up to the Royal visit, and many people were reportedly unable to make the trip to see the Queen and the Duke. 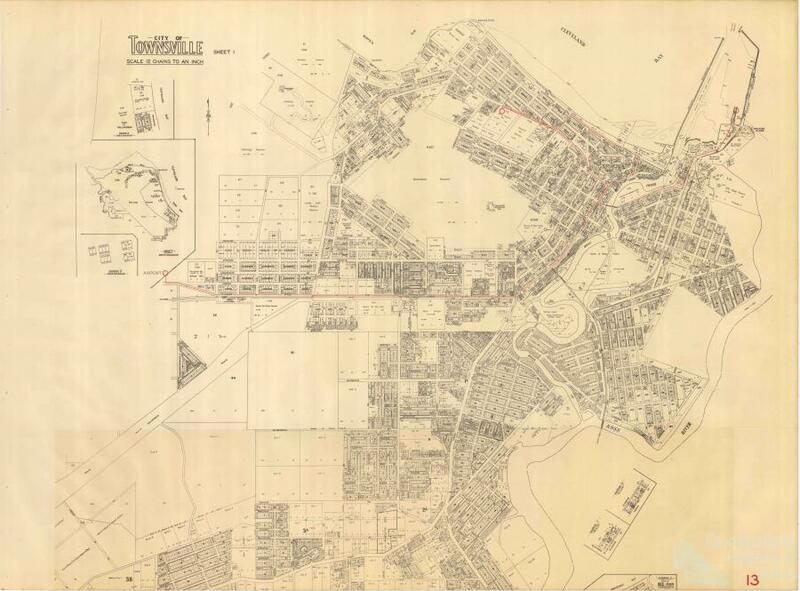 Despite the conditions a reported 50,000 people were present in Townsville on 12 March. People travelled on horses and in tractors along flooded roads and nearly 1000 people used boats to cross flooded rivers. The Queen and Duke flew to Brisbane from Toowoomba on 11 March before flying the next day to Townsville. To get from Townsville to Cairns the Royal couple changed their mode of transport and sailed on the Royal yacht, the SS Gothic. They arrived in Cairns on 13 March at 11.30am. People waited overnight on the wharf and in the streets to get the best vantage point. 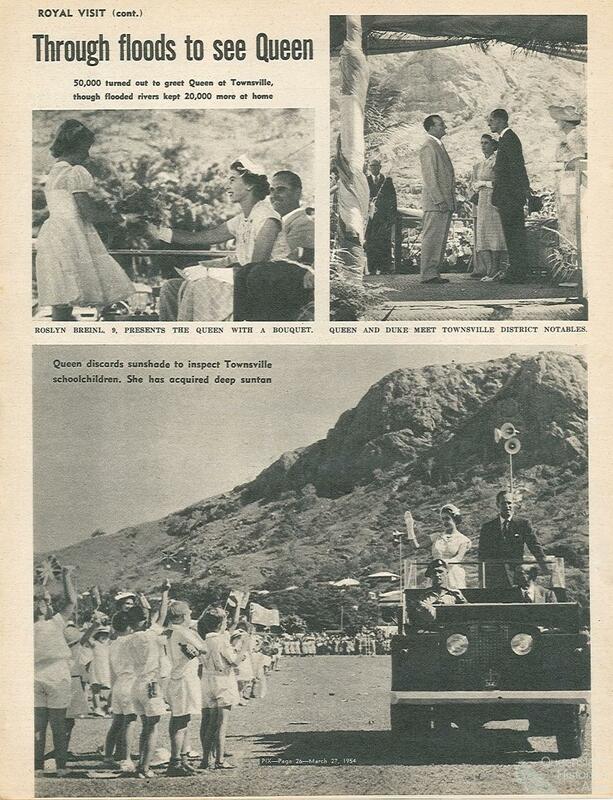 The couple’s time in Cairns was very short, however, and by early afternoon the Queen and Duke were back on the Gothic to cruise south to Mackay through the Whitsundays. They left the yacht to view the reef in private through a glass-bottomed boat, and spent a free afternoon on Seaforth Island. 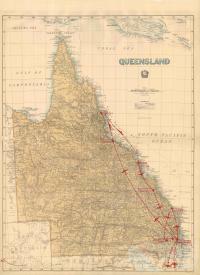 They then continued to Mackay and Rockhampton which, like the cities further north, had been affected by floods two weeks earlier. In both locations the Queen expressed her sympathy for those who had suffered in the floods. 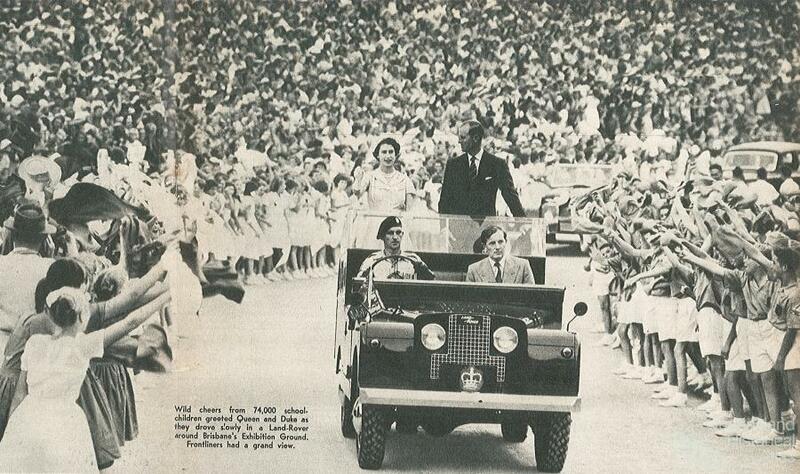 The couple flew from Mackay to Rockhampton where 75,000 people converged on the city to see and hear their Queen. Some travelled from Longreach, approximately 700 km west. In Rockhampton the Royal visitors attended an afternoon tea that featured sandwiches cut out in the shape of maps of Australia and Queensland. The afternoon tea included two fruit cakes made in the shape of crowns with jelly beans and silver cachous for jewels. The ‘maps’ contained considerable detail with the state divisions marked with vegetable extract and flags of mint indicating the position of Rockhampton. 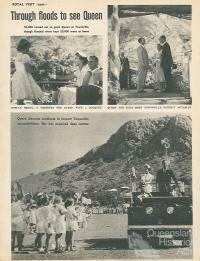 Perhaps over-protected from the heat and conditions of inland Queensland in 1954, the Queen's itinerary for later tours included Mount Isa and Longreach.